You are here: Home / Travel / The Way a Relaxing Vacation Should Be! I love to travel. Who doesn’t, right? There is something about stepping away from your everyday life and getting to see somewhere new that is exciting, fascinating, and so much fun! However, nearly every time I head off on a “vacation,” I end up coming home more tired than I left and wishing I had time to just relax, sleep, unwind, and de-stress while I was traveling. We have taken two family trips this year – one a long and extremely exhausting though very memory filled road-trip across 10 different US states. The trip involved a 15-passenger van, nightly tent set-up, and a slew of eight kids all under the age of eight. Exhausting is an understatement. I’d crash on my air mattress at the end of the night and be ready to fall asleep by about 8pm, always waking up in the middle of the night to pump up the air mattress again and struggle back to sleep. On our other trip my husband and I took our two older boys to Disneyland. We literally ran through the park each day trying to squeeze in as many rides as we could and ended each night at the hotel with aching feet and complaining kids, despite the fun we had. It was time to take a relaxing vacation. A trip where I could truly unwind. Just me and my hubby. A “babymoon” seemed like a great excuse. 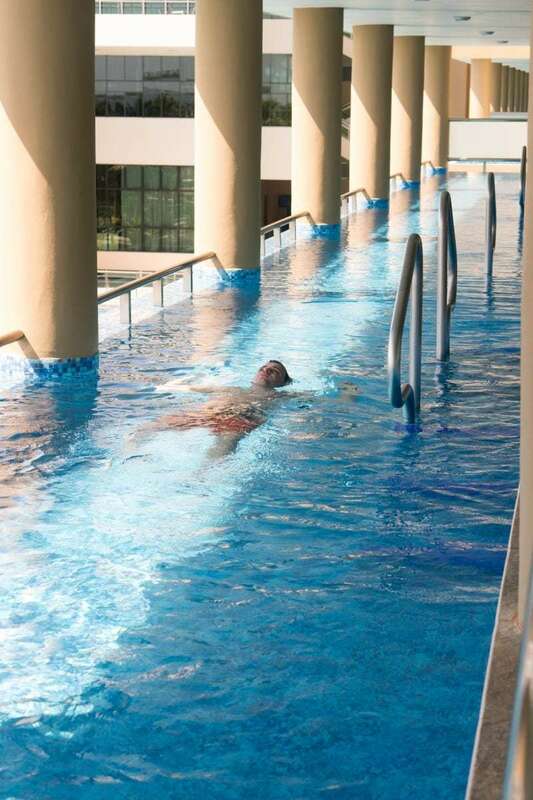 When I got invited on a press trip to visit Generations Riviera Maya – a Karisma Gourmet Inclusive hotel in Cancun, Mexico, there is nothing that could have held me back, (other than a passport, had it not arrived in time). The date was set, and we were beyond excited – counting down the days. My husband, Danny, and I met on a cruise that sailed to Cozumel, which is just outside of Cancun, almost exactly 10 years prior to our trip. What a perfect time to getaway together! When we arrived in Cancun and at our resort it was like we were entering a whole world set aside just for us. We were greeted with a cool towel, a nice reprieve from the humidity, as we checked in. A butler took care of our bags and we were shuttled over to the property and given a tour of where the restaurants and services were located and reminding us that everything during our stay was complimentary and included, except spa services, excursions beyond basic water sports equipment, and select wines that were available for purchase. I heard what the butler was saying, but it didn’t all start to sink in until we had spent that first day at the resort. I no longer carried my purse – or really anything but my room key – with me anywhere we went. We could get just about anything we needed anywhere we went on the property. Our absolutely stunning rooms had a bedroom area and a room divider that separated a living room seating area that could be converted into a pull-out bed, if you needed the extra space. 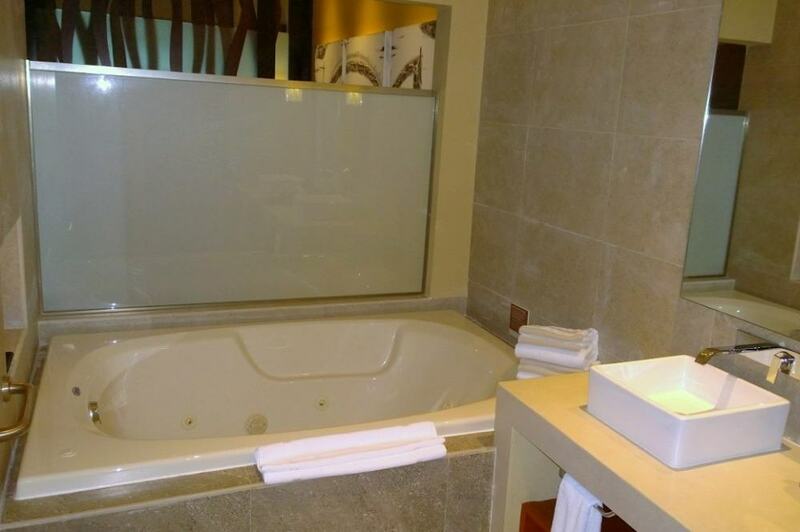 Following that, led to a large and full bathroom suite with a waterfall style shower and an enormous jacuzzi tub. The rooms are a very generous 900 square feet for the smallest rooms on the property giving you plenty of personal space. Your space doesn’t end inside your room. Right outside our room was a private balcony that led to an infinity pool that spans the length of about 12 rooms. I slipped into that pool just about every day, followed by a nice long soak in the jacuzzi tub. The highlight feature of a Karisma Gourmet Inclusive hotel, outside of their outstanding staff and rooms, is the dining experience. They pride themselves on top quality dining options and we were able to try some really exquisite meals. Traditional all-inclusive resorts have the reputation for long lines and poor quality food, but you won’t find that at Generations or the other Karisma locations. 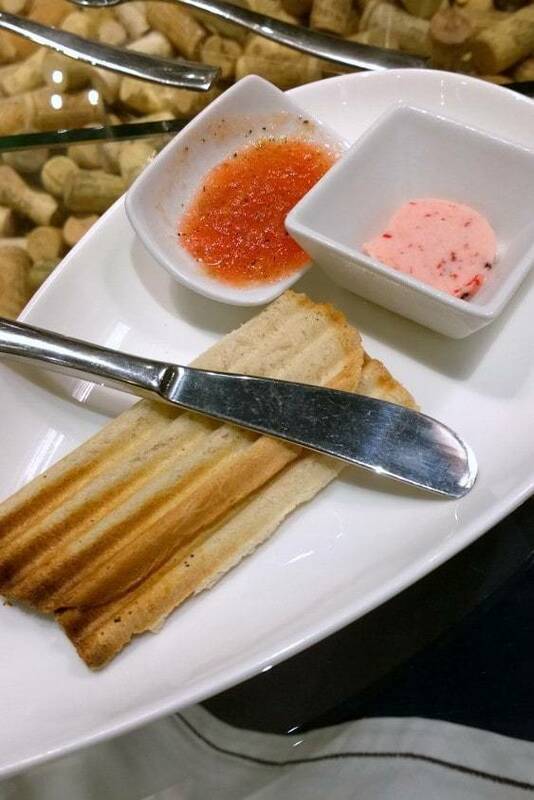 It was definitely a whole different dining experience than what I am used to with really fine dining menus. There was one dish in particular that really stood out to me – a wild mushroom soup. 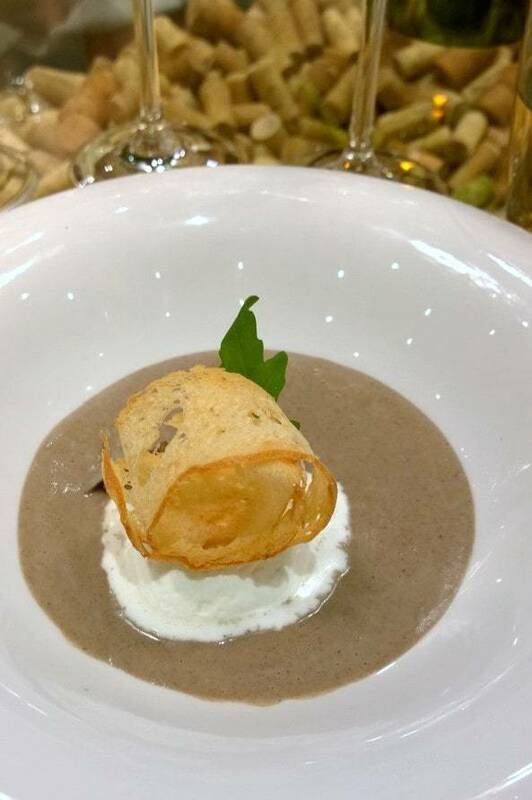 It was a warm creamy soup with a cool scoop of white truffle oil in the center. When you took a spoonful of them together it was amazing how well they blended to create a whole new taste and texture. When staying at Generations, you are able to visit either of the two sister resorts which triples your dining options and beach front. The other two resorts are adult-only, which will afford you the opportunity to stay at a family resort, check the kids into the kids club, and then escape for an afternoon with your sweetheart. The beach-front across the three resorts is about 2 miles, so you could walk between the properties or catch a golf cart shuttle that runs about every 10 minutes. I even got a whole fresh coconut at one of the bars! We snuck over to one of the sister properties for lunch at Jojo’s, a Caribbean cuisine restaurant, where Danny ordered the fresh catch of the day – Mahi Mahi. 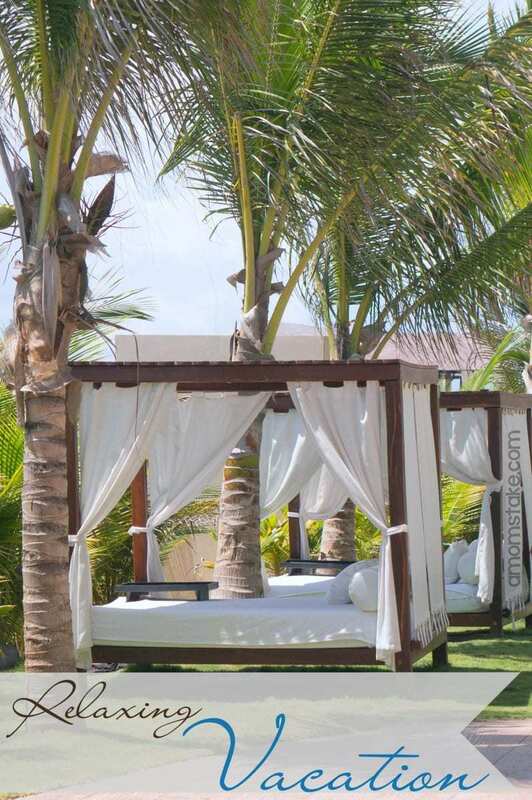 On our walk back, we stopped for an extremely relaxing nap in a private, beach-front cabana. The sound of the ocean and the cool breeze with the warmth of the sun but the shade of the cabana made for an amazing stop that was the highlight of my trip. It felt like a literal slice of Heaven on earth. 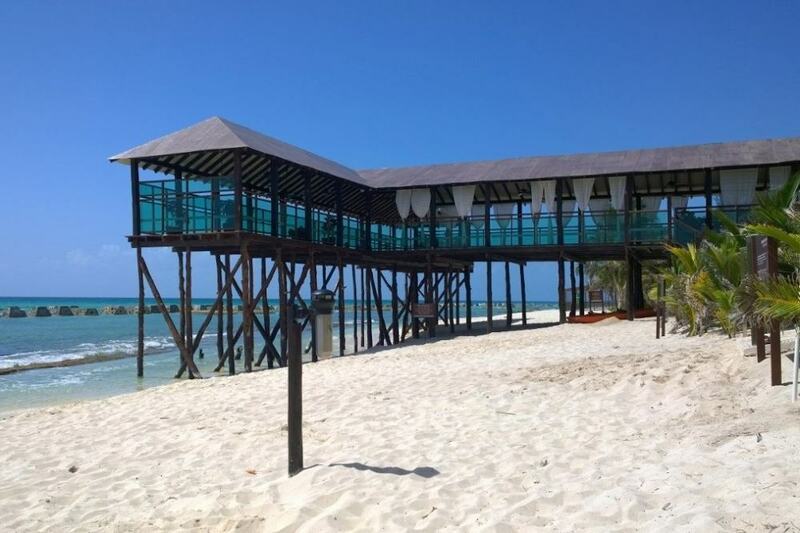 There is no reason to ever leave the resort, there is so much to do, but if you have a certain excursion in mind they are easy to book with Lomas Travel group located at the resort. Danny has been dreaming of swimming with the Whale sharks for four or five years now, asking me to head to Cancun every August. We finally made it, right in their peak season. Danny booked an excursion that picked him up right from the resort lobby and included his meals and transportation all through the day. The excursion started with the Whale sharks where the boat with 10 passengers took turns two at a time snorkeling with these massive 15-20’ long sea animals. He reported that there was more than he could even count, but guessed that there was probably close to 100 whale sharks all around the area they stopped to snorkel. He absolutely loved the excursion and his experience. We can’t wait to take our next trip back to a destination where we can play, enjoy, and relax together as a family or alone as a couple. 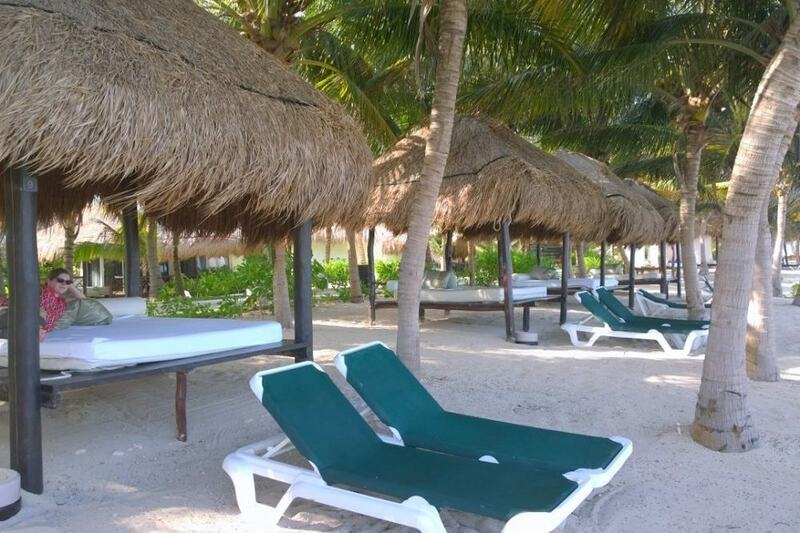 There is nothing that compares to a vacation like the one we just experienced at Generations Riviera Maya. I absolutely recommend Karimsa hotels when you’re planning your next getaway. 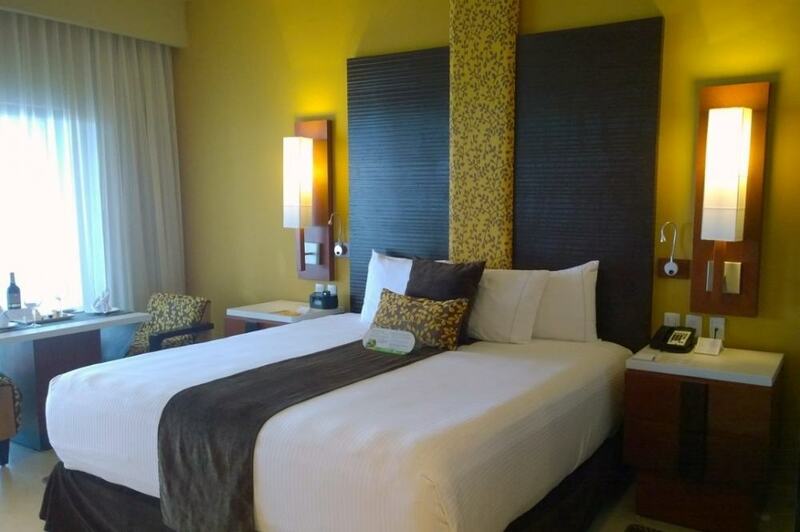 I received a complimentary press trip to visit Generations Riviera Maya. All opinions are my own. Definitely sounds like a vacation made in heaven. That is a awesome pool too. Oh my! This looks fantastic! I need a vacation with my hubby and this looks perfect! This looks like the most beautiful place. These are the types of pictures that you dream about when you go on vacation, lucky for you they were true! What an absolutely amazing escape! That infinity pool looks like heaven. Sounds like an amazing place to visit! Can I go? My hubby and I are long overdue for a kid-free vacay! This looks like an amazing trip. That infinity pool is awesome! WOW! This certainly does sound and look like a relaxing vacation! Wow, it looks heavenly. I’m going to talk to my husband about taking a “real” honeymoon there… maybe for our 20th wedding anniversary. I absolutely love, love, love all inclusive resorts! Everything you could dream of right there and more! That’s so breath taking to look at! Oh wow… that really is a little slice of heaven! So gorgeous! This looked like an incredible getaway. We’ve never taken a vacation, and for sure never a trip like this. I really wish though, it looked so fun and relaxing! Yes! Hubby and I always struggle between “busy” vacations with sightseeing, etc, or laying on the beach. We really want to get to Europe, but some how always find ourselves in the Caribbean. 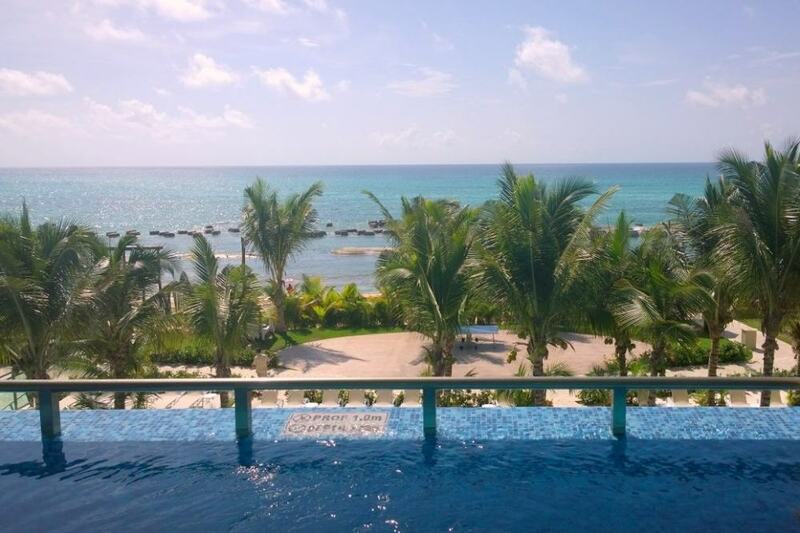 After our all-inclusive honemoon in the Riviera Maya, I will ALWAYS do all-inclusive again! THe resorts are amazing and you just really feel pampered. I am so in need of a relaxing trip like this. 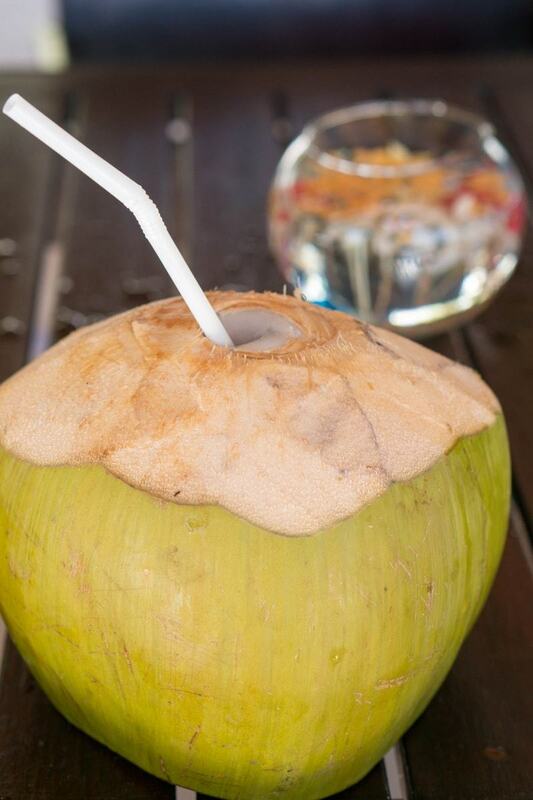 The drink out of a coconut looks heavenly. That food does look pretty amazing. I am all for a relaxing vacation on a beach like that. However, it might take me a bit to get out of that tub! This looks like a beautiful resort. I would love a relaxing vacation right now. The food looks amazing. Whoa! That looks amazingly relaxing! I’m curious though, did you rent the 15 passenger van or do you own one? We’re debating purchasing but I was also wondering if I could get one to do a review. My mother-in-law purchased one that they’ll hang on to for a few years to use for summer road trips. You can get an older one for really cheap and they really don’t drop in value overtime as they are so cheap to begin with. She paid about $3k after replacing the tires and fixing the A/C, I believe. I’m glad you were able to relax, some vacations are so filled with activities you’re too tired to enjoy it. This looks like it was a pretty amazing vacation. I need to get away and would love to take a vacation with just the hubby. A babymoon sounds good to me. Everything looks great, and I like sister resorts too, it does open up a ton of new options. Oh wow! This looks gorgeous! I would stay there for sure! What a fabulous trip! Drinking from coconuts and toes in the sand. My kind of vacation! Right now, all of our vacations are family vacations. The first thing I am doing when the kids move out is taking a relaxing vacay with the hubby. This looks like an amazing place to start! That pool looks absolutely divine!! I would love to take a trip like that!! Wow this is a beautiful resort! Relaxed just looking at the photos! wow this looks so nice. i need a great get away. Oh my! What a beautiful place. It definitely looks relaxing. I think I need to go there right now and get away from everything and relax. Everything about it sounds perfect and I love that it’s all included. That infinity pool is awesome! I’ve never seen one like it. I’d love to get there someday! I’d like to escape there. I’d go right now if I could! I have not had the pleasure of visiting Cancun. Your photos of the gorgeous resort are great. Everything looks fantastic. WOW! What a beautiful place to visit! I LOVE all inclusive resorts, my husband and I went to Sandals in Jamaica for our honeymoon and it was so nice not to have to worry about carrying around money or anything else for that matter! That place is ridiculously gorgeous. I’d love to hang out with the hubby there for a week… or TWO! Wow, that looks like an amazing place to stay! I could stay in that infinity pool all day. This all looks very nice and relaxing. I have to say though, the infinity pool is amazing! I would love that! That looks amazing. I could go for that right about now. I’m just about due for some relaxation. this place looks amazing.. so beautiful. I would love to spend some relaxing time there. I haven’t been on a vacation in so many years. That looks and sounds to die for and the pool is amazing! I would love to spend some time at a place like that with my husband. It looks amazing. I love to take vacations too. I took my grown children and grandchildren to Myrtle Beach in 2012 and we had a ball. It was tiring having three small ones (at least for me) but it was all good. I try to take at least 2 vacations a year. They are usually less than a week long because of funds and being a widow but I just love traveling. Went on a cruise once and that is what I call a real vacation. Hope to someday be able to do that again. I would love to take my grandsons to Disney. That is my dream because I took my kids when they were little and it was something to see the awe in their eyes. Wow, that looks amazing! I know exactly what you mean about most vacations. You need a vacation to recover from your vacation! I don’t think that would be the case at this resort though.